Hyderabad, Mar 05: It seems that veteran actors are looking to co-star with younger heroines rather than 30-plus actresses. While the shooting of 'Manmadhudu 2', starring Rakul Preet Singh and Nagarjuna is all set to start soon, the Rahul Ravindran directorial will see Nagarjuna, who is going to complete 60 this year, playing a 40-plus person romancing the 28-year-old Rakul. Interestingly, Rakul had acted opposite Nag's son Naga Chaitanya in 'Rarandoi Veduka Choodam'. Veteran actor Venkatesh, who romanced Tamannah in his last film F2, is now paired opposite a much younger Payal Rajput in his upcoming film 'Venky Mama'. 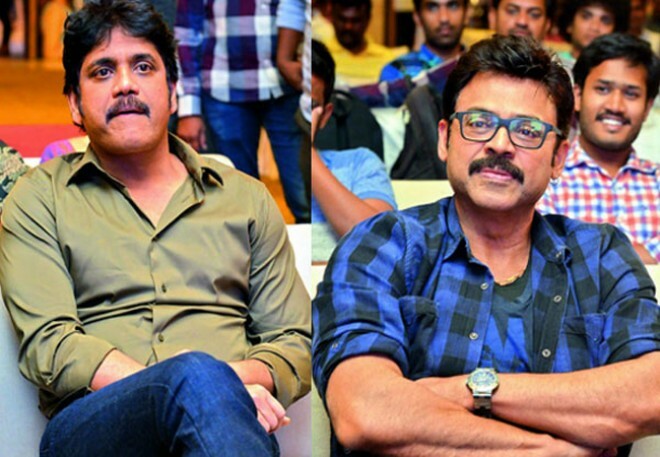 Although Venkatesh is also nearing 60, he too is looking for actresses half his age to work with. Similarly, Chiranjeevi is looking at Anushka Shetty or Nayanthara as the female lead in his upcoming film, as he feels other actresses may look odd opposite him. Meanwhile, the actresses are reportedly getting paid a hefty remuneration to romance senior heroes. Rakul reportedly gets 1.5 crore while Payal also pockets a good amount.